A library by Daniel Brown and Andreas Freise for the programming environment processing. Last update, 03.09.2013. This library provides a set of tools for drawing graphs in 2D or 3D. We have developed the library in order to be able to use processing for simple scientific simulations or data displays. 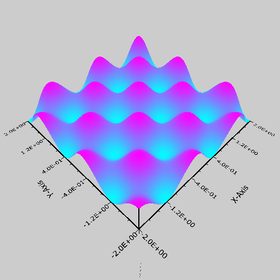 While processing itself makes the graphical output very easy, a good library for plotting functions or data was missing. So far, the content of the library directly reflect the need of our research group, but we hope that it might be useful for many other people. Any comment, feedback or suggestions are very welcome. You can find examples of what we are doing with processing in our list of processing sketches. This release is not fully compatible with previous versions, please the file CHANGES.txt for details. Download gwoptics version 0.5.0 (03.09.2013) in .zip format. Unzip and put the extracted gwoptics folder into the libraries folder of your processing sketches. Documentation and examples are included in the gwoptics folder. Documentation Have a look at the online documentation here. A copy of the documentation is included in the .zip as well. Source The source code of the library is included in the .zip file and is also availabe on github at https://github.com/gwoptics/gwoptics_plib. Find a list of examples in the current distribution of gwoptics, or have a look at the source code of a subset following the links below. by Daniel Brown and Andreas Freise, 03.09.2013.